Con/ sound with glossy dark olive patina, cleaned and waxed. Museum quality! The Hallstatt culture was the predominant Western and Central European culture in Early Iron Age Europe from the 8th to 6th centuries BC, developing out of the Urnfield culture of the 12th century BC (Late Bronze Age) and followed in much of its area by the La Tène culture. It is commonly associated with Proto-Celtic and Celtic populations in the Western Hallstatt zone and with (pre-) Illyrians in the eastern Hallstatt zone. 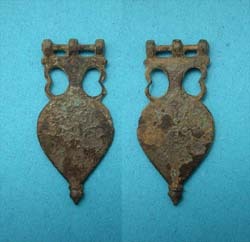 Seller's Note/ Torcs like these were worn by men on their lower arms, close to the wrist, to distinguish themselves as warriors of note, often times as a gift from the tribal leader after battle. Ground found near the Drava river, these torcs are extremely rare! Last note: in the photo you can see that it could not fit over even the smallest wrist. But remember, back nearly 3000 years ago, the metal was quite malleable and could be easily opened and closed. Not now! DO NOT try to open it any further or it will snap in half.